It ain't the Wakanda you've been looking for. Per a blog commenter's recommendation somewhere, I just read this interesting book by Mr. Keith Richburg, published back in 1997. Mr. Richburg was a Washington Post foreign correspondent, who wrote this book about his experiences in and about the continent of Africa (pretty much the sub-Saharan part, excepting Somalia) while on assigment there for 3 years or so in the early 1990's. Not to spoil the theme for you, but I'll just say he was glad to have bugged out after that reporting assignment, and last was noted living in Hong Kong. As this is a book review, I'll note first that the readability of this book is so-so. I don't mean it's hard to understand, but it just doesn't read as nicely as that from the best authors - I'd but it in the bottom 3rd of the non-fiction reading I've been doing lately. Does that mean Mr. Richburg was an Affirmative Action hire at the Washington Post? It's hard to prove that, but yeah, probably. Please note that Peak Stupidity does not claim to write even as well as Mr. Richburg, but then I don't make the big bucks... YET! Were I assigned to the African continent, I'd turn it down, so kudos to this gentleman for that. 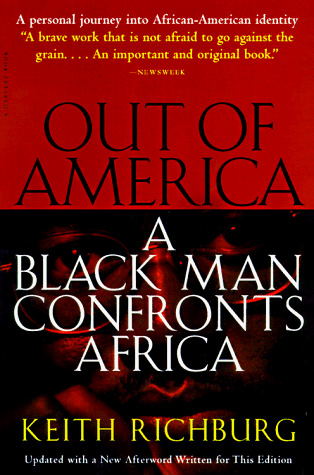 Keith Richburg gives a very honest account of the state of affairs on the dark continent, circa early '90's, even as he started out with biased attitude, as that black man yearning to see the land of his roots. The honesty, anyway, starts early on in the book, as the author accounts for his time, mostly around white people in good schools in the Grosse Pointe (haha, extra ritzy and expensive due to those extra "e"'s - last paragraph) neighborhood, NE of Detroit. He grew up around white people and pulls no punches in explaining why his Dad wanted him to grow up that way. The storyline, BTW flips back to Mr. Richburg's childhood now and again, which works pretty well. It reads like the author, as a reporter, was allowed to pick and choose somewhat where in this big continent he could do his observing and writing. That sounds like a great gig, with his base of operations, so to speak, out of the relatively safest place around, Nairobi, Kenya. He was told to go to certain hot areas, which for most of the book, meant his time in Somalia during the time of the US military airlift operation "Restore Hope", later to become "Blackhawk Down", Rwanda (no, not Wakanda, Rwanda - those place always get confused) in the midst of the African vs African million-fatality attempted genocide, and then Liberia and South Africa. The more detailed and lengthy writing in Out of America is on the experience in the first 2 locations. What Mr. Richburg was most shocked about, even in the non war-torn countries, such as his Nairobi base, was the cheapness of human life in Africa. The corruption, laziness, and lack of Western-style organization is noted right away, from the time the author got settled. This book is full of good descriptions of the sheer stupidity, random violence (where've we heard about that before? ), lack of morals and concience seen in general African life, even with a lot of good apples thrown in there. This is everywhere, before we are told about the experience in Somalia, Rwanda, etc. The number of good and, at the same time, non-stupid. people does not ever seem to be enough to break through and create anything more than this land of huts, subsistence farming and gathering, and big men that accumulate the wealth (to be parked in trustworthy place, meaning out of Africa). There's no breaking away without white people, but no that's colonization, which is bad, mmmkaaay? In the big chapters on the more specific experiences of Mr. Richburg, the horrors that he saw in Somalia, Rwanda, and lots of other locations, added to his disdain for the land of his forefathers. It's worth reading, as he is very fair in explaining how the famine situation in Somalia did not, and could not, get solved with the massive airlift operation, which created nothing but resentment. Rwanda, where the millions of Tutsis (the taller, somewhat more well-off ones) were murdered, mostly with machetes by the resentful Hutus (the shorter, originally less well-off ones) is where the author was most distressed. He recounts seeing bloated bodies float down the Kagera River, over the falls and down into Tanzania, more than can ever be counted, more than once. Mr. Richburg's most repeated line is "they don't count the bodies in Africa". Once could argue that Keith Richburg just arrived in those African countries at the wrong time. He would be the first to tell you otherwise. Even with no on-going war, the place is run tribally, and even in countries organized along the limes of a tribe, life is violent. Regarding the civil war or attempted genocide in Rwanda, the reader could well argue, as has been done many times, that what was seen there was no more violent than what would have been seen by a visitor to most place in Europe in 1943. That's a valid argument and a good subject for another post. 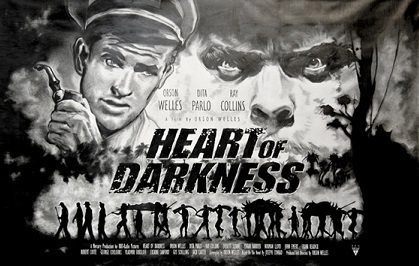 Upon arrival on the dark continent, the author was still hopeful to find that it was that Western colonialism, or its aftermath, that was the cause of all the troubles in his ancestors' homeland. After 3 years of seeing how Africa "works", Keith Richburg was disabused of those notions, which are still used as explanations by the ctrl-left, most blacks in America AND Africa today. Mr. Richburg puts the blame of Africa's problems on Africans alone. He has a whole lot more gratitude for being "out of America" after his time spent in the hellholes he's described. I will post a follow-up review just to discuss the ending of Out of America shortly, as the very last portion has some less-honest, or at least a bit more delusional than his honest assessment in the heart of the book. Joseph Conrad's book is closer to the truth than most will admit. PS: Keep in mind, I.G., that this book was written 23 years ago. It's a whole lot more honest than what a black writer, much less a non-blackety-black writer, could get away with now. You convinced me. I'll read this one. I've never read anything about American black identity. It's probably high time I read into blackity black in order to understand it better. Liberals and jews certainly won't and don't. Maybe that's why they keep getting it wrong? I suppose the bad thinkers have to carry their water like we always do.